Whether you want your toddler to be the next Michael Jordan, or you just want them to enjoy playing basketball, buying the best toddler basketball hoop is a must! Buy it as a gift for Christmas, a birthday present, or just simply to keep your child occupied; you should ensure that you have one of these in your household. Basketball at such a young age doesn’t just provide endless amount of fun, but acts as an awesome way to indirectly improve hand eye coordination. A hidden way to teach your kids a lesson without them knowing! Simply said, don’t settle for anything on the market. The following hoops are excellent for toddlers and small kids alike – check to make sure that the one you’re after suits the recommended age range. Either way, most will be adjustable to grow as your toddler grows. If you didn’t want the full apparatus, then why not check out some over-the-door basketball hoops. As always, in this guide, we look to PRICE, PERFORMANCE and DURABILITY as the main factors to aid our judgements. If you haven’t already heard of them – Little Tikes is an extremely popular brand producing some the best and innovative play-sets for kids to play in both indoors and outdoors. This doesn’t just include basketball. 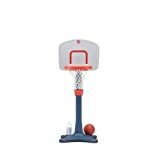 Looking to the EasyScore Basketball Set from Little Tikes, we believe it is one of the best basketball hoops for toddlers. First of all, it’s made from a soft plastic, so you can be assured of safety. The rim is also oversized, making it much easier for toddlers to make those shots and slam dunks. Surprisingly, it is also extremely diverse as the high quality plastic allows for the hoop to be used either inside the house or out in the gardens. To prevent the basketball set from tipping over while your kids are playing with it, the base of the hoop is designed in such a way to open it and fill with sand or water. This aims to allow for a heavy foundation to ensure the hoop is prevented from tipping. Without anything in the base, the hoop set weighs only around 10 pounds and thus can be easily carried around the house. According to Little Tikes, the EasyScore set is best suitable for kids between the ages of 1.5 to 5 years. Accordingly, the hoop has suitable adjustments to increase the height from 2 feet to 4 feet to best suit the heigh required as your kid grows up. Coming in at a very affordable price point, and with 3 balls included, this is great value for money and a hoop that you must consider. Another highly recommended basketball hoop for toddlers is the Step2 Shootin’ Hoops Junior Basketball set. By way of comparison, the Step2 Shootin’ Hoops is similar to the Little Tikes option as the base can also be filled with either sand or water to stabilize the play set from tipping over. Similar to this, the Step2 is made from a high quality plastic and sturdy material that enables the hoop and the rim to last for years on end. The rim is specially designed to be wider to enable your kids to score easily. This means that the 6 inch basketball that comes with the set will have no issues going through the rim. The large backboard also makes it easy for the kids to shoot the ball into the hoop. A small feature that we love about the Shooting Hoops Junior Basketball set is that it has holders to keep your bottles or cups to quench your kids’ thirst while playing. Based on its adjustable height if 30” to 48”, Step2 recommends this hoop for ages of 1.5 years to 5 years. Overall, it is a great sports toy that helps your kids improve their motor skills and keep them occupied and active for a long time. Most people already know about Fisher Price as a brand. They’re renown for making some of the best toys for babies and toddlers. This is no exception. 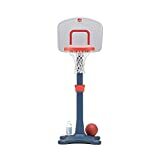 In most lists on the internet, Fisher Price’s ‘I Can Play’ Basketball hoop is considered the best toddler basketball hoop on the market. Unfortunately, they’re no longer made or sold. The new and improved version is now called the Fisher Price Grow to Pro Junior Basketball Set. In our opinion, this is by far the most stable and sturdy hoop on this list; suitable for both indoors and outdoors. One of the main advantages of the Grow Pro Junior hoop is that you don’t need to fill in with sand to prevent it from tipping over. This hoop is designed to be self-stabilized. Additionally, because of its structure, it occupies less space when compared to the alternative sets on this list. The Fisher Price Grow to Pro Junior Basketball set comes in a very attractive colors featuring blue, yellow, red with white and gray accents. A basketball perfectly sized for toddlers also comes with the set. Fisher Price states that the most suitable age bracket is between 1 years to 3 years old, specifically because it comes with only 4 adjustable height settings that range from 24 inches to 40 inches height. This is evidently a bit limiting. If you want a sturdy, stable option that will last a few years both indoors and out, then the Grow to Pro is an absolutely ideal option – just don’t expect it to be suitable as your child reaches 5 years old! In terms of the actual play set, it’s probably wise to look into the various aspects of the hoop for safety concerns. Make sure of the material of the hoop is not too harsh or pointy in the event that your child could cut themselves. Similarly, make sure that the hoop is not susceptible to falling (double check the stability!). Plastic hoops are always the best recommended ones for toddlers from getting hurt. For us, all three options on this list of best toddler basketball hoops meets all required safety concerns you may have. Kids grow quickly, which means that you need to invest in a hoop that grows with your child. Unless you had copious amounts of money, you can’t buy a hoop every year. Due to this, ensuring you have a hoop that allows for an adjustment in height, as well as a durable and sturdy plastic to last for years are integral. Keep note of this. Whilst all the products on this list are extremely durable (with some able to be used outdoors as well), make sure that the height of the hoop is suitable for the height of your child. …and most importantly, the reason behind buying a hoop is to keep your children entertained and occupied for a long time. That means you need to go for a hoop that provides the required fun and entertainment needed. Try to go for hoops that are colorful and are easy to score. The last thing you need is to have your kids bored with the playset not being able to score at all. Try to invest in hoops that have a wider crown over the hoop and a larger backboard that makes it easy for your kids to score. Although there aren’t a whole lot of options out there, singling out the best toddler basketball hoop is tricky. For us, based on price, performance and quality, we think that the Little Tikes EasyScore offers everything you can possibly want at such a great price point. If, for whatever reason, you don’t like the option provided by Little Tikes, then any of the other 2 options on this list have our support. At the end of the day, there isn’t too much difference between all the options out there. Like always though, do your own research, and make sure that the product you’re after best suits your needs.